How do I switch the new Android system to the original BMW CCC/CIC/NBT/EVO interface? Answer: Please tap “Car-info” icon on the home screen OR long press (3 seconds) MENU button on iDrive to switch to original CCC/CIC/NBT/EVO interface. Why it shows"NO SIGNAL" when tap "Car-info" or switch back to original BMW interface? Answer: Please check the LVDS port. Make sure you connect the LVDS plug (removed from the OEM screen) to the new screen. Different systems have different LVDS plugs. Why there is no audio from new Android system? Answer: You need to activate AUX-IN function. 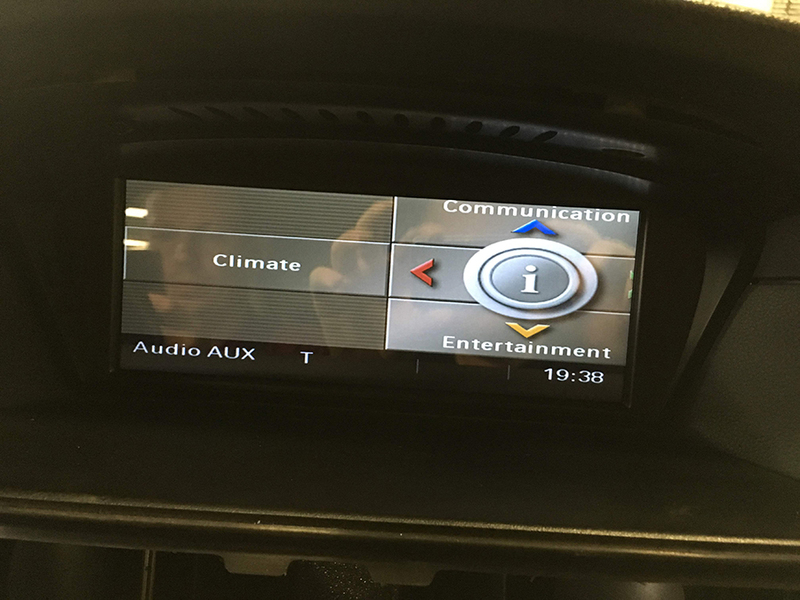 Why have I changed the sound input mode to AUX but still have no sound?Why does the Sirius/XM radio, original car computer info and factory camera does not display? Answer: Please check the fiber optics plug, you need to move it from the original connector to new connector we provided. My car has factory backup camera, why it does not display when reverse the car? Answer: Please check the Settings/system setting/Rear camera type. Make sure the "Original camera" option is activated.If you switch to "Original Camera" it still doesn't work, you can try other options. Why my idrive knob not working properly? 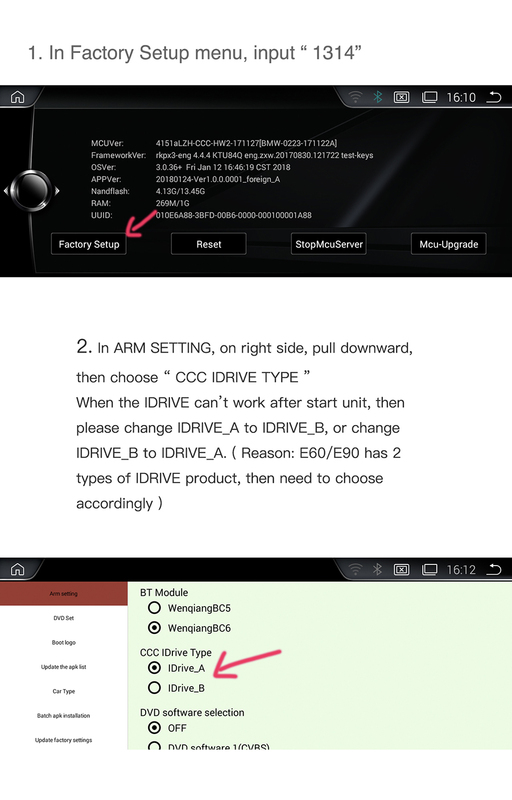 Answer: Please change the idrive option in the factory settings. The factory setting password is 1314. Answer: Please change the car type option in the factory settings. The factory setting password is 1314. Please choose the right model. For example, your car is E60/E90. You need to choose E60 model. The E60 has three options. One of them allows the original screen to display correctly. You need to try them. 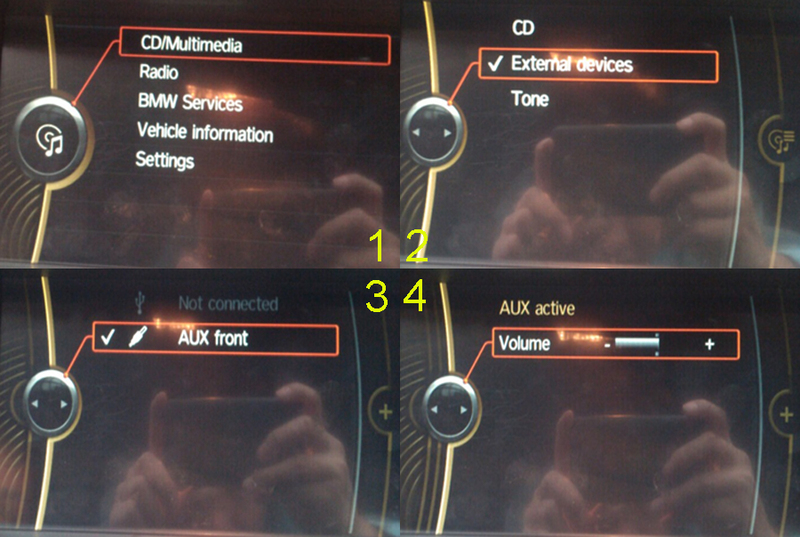 if sound jump, turn the AUX switching mode to "Manual"
Answer: Please check the Settings-setting-Rear camera type. Make sure the "Original camera" option is activated.